It is a pleasure to have corrections to my stories when the results will be helpful, and especially when they come from true experts in the field - in this case, David Steinberg, whom many readers will remember from his Chattanooga Choo Choo days. I personally remember him from many occasions when he was functioning as "Conductor" on the yellow streetcar which made periodic circuits around the old station's parking lot, returning after a nice long ride to its starting point on the southernmost platform. David Steinberg's comportment and appearance as a tall, thin, immaculately uniformed and bearded Streetcar Conductor could make you feel like you were taking an actual trip on a Chattanooga streetcar of the early 1900's. He would be ringing up fares while his passengers were finding seats, and before taking his position at the car's throttle. Anyway, David was amicably in touch about some errors I made in a recent story showing what I mistakenly termed the "Trio" postmark. As I have said, Mr. Steinberg is an expert in the field of local railroads and streetcar lines. He has written at least three paperback books on the subject of Chattanooga's city railroads which show the routes of every one of them. These streetcars (called "trams" in other locales) all disappeared from our streets before 1950 leaving not a trace. (David says the actual date was April 11th, 1947). Only David's books and vintage photos are left to inform the younger generations of their pre-eminence in earlier times. One of those books discusses the former entire Chattanooga municipal transportation system which included both streetcars and buses, and the Chattanooga Public Library has a lot more of his research archived there. 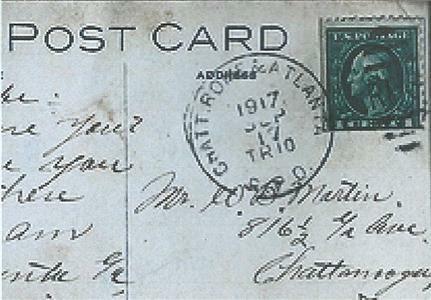 In my story, originally published here on October 16th, I made the claim that the word "TRIO" on the postmark referred to the trio of cities indicated: "CHATT ROME & ATLANTA", and I failed to deal at all with the letters "R.P.O." at the very bottom of said postmark. I was admittedly negligent in not checking the facts, though Mr. Steinberg graciously overlooks those transgressions. I was relying on things my dad used to talk about 70 years and more ago, and my memory was/is blurry! Turns out that my interpretation of the letters "TRIO" was totally wrong: it stands for "Train 10" - a Railway Post Office (R.P.O.) train - which made a daily (weekday) circuit from Chattanooga to Rome and Atlanta. That train has long since been deleted and the tracks taken up! I think it traveled on the Southern Railway route, whose northern terminus was at Union Depot (of which I did a print many years ago), and which stood across MLK Boulevard (then called West 9th Street) from the Read House in downtown Chattanooga. It had no connection with our "Chattanooga Choo Choo" hotel facility, which was then called, "Terminal Station". If you want to find out much more about local railroads (with lots of pictures) I strongly recommend John Wilson's great book, "Railroads In And Around Chattanooga" (available at Zarzour's Restaurant on Rossville Avenue, near where it turns off Main Street). I was truly astounded by all the good, clear photos that John found and printed in that book which can help younger train lovers mentally reconstruct the days when passenger trains abounded here. As for David H. Steinberg's books - he has the three mentioned above, with possibly at least one more in the planning. I find none on Amazon, but at least one on Ebay. Obviously getting rarer by the minute, I hope your search will be fruitful! Keywords are, "Chattanooga Transportation". So I apologize to both John Wilson, Owner of this daily newspaper, for "getting it wrong", and also to David Steinberg, whose expertise threw light on my errors.